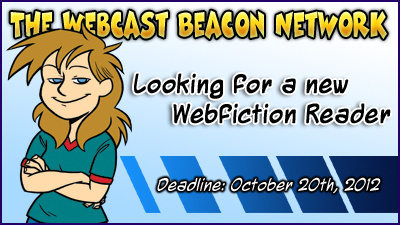 Looking for a new Webfiction Reader for the Webfiction World podcast. Kara Dennison and Witchiebunny (The Webcast Beacon Network’s break bump and intro announcer) are currently assigned to do readings, but we lost a regular webfiction reader due to their own workload. Anyone that would like to try out for this reading should contact us aswebfictionworld@gmail.com with a recorded sampling (a minute or two) to see how well you perform. Even if you have a crappy microphone, try it out. Anyone interested must have a passion for it, and should be committed to doing the readings through the end of the whole arc. If you have both the passion and commitment, AND good reading performance skills, BUT you have a crappy microphone, we can get you a headset to use. Nothing special but should be a well decent quality for a replacement. Feel free to contact us with any questions and for other details.